I was brought up to believe that women were inferior to men. In fact, my father had a saying, “Water is the second most destructive force in all of nature!” which begged the question, “What’s the first?” He would laugh and say, “Women!” He also had a list of occupations suitable for women. It included housewife, secretary, nurse, and teacher. I wonder at times how I came from childhood with any sanity! I suppose Pollyanna and Joan Rivers helped me wade through the muck. The world has always struggled with a woman’s place, and I’ve wondered at the worry that is wasted over such nonsense. I know fear sits at the center of the worry, and I do wish that men and women could both see the importance of making God’s presence the priority rather than trying to find the proper setting for women or men. The right setting for men and women is at God’s feet. The jockeying for positions closer to the feet only hurt the work and take away from the worship. If we look to Christ for our answers, He made it clear that the last would be first. Women were definitely forced into the background when He walked the earth. He had a different attitude that is obvious in all the gospels. He saw only the hearts of those around Him and didn’t divide. Christ brings oneness and unity that puts all of us in the proper setting. Ann Voskamp was part of the learning this week. 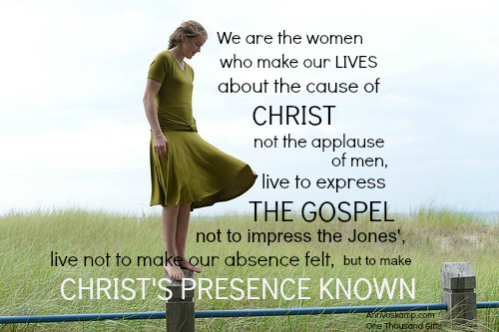 Here’s a beautiful post from her that helped me see myself in God’s light.